Threads of Yoga is a “remix” of Patanjali’s yoga sutras, pieced together from a dozen other translations, classical commentaries and reflections from 15 years of personal practice. It presents this ancient text in a revitalized form, as if Patanjali’s vast acumen for consciousness studies had benefited from the discoveries of modernity and postmodernity. It’s a project I began with my friend and colleague Scott Petrie. In the text and commentaries, I blend philosophy, psychotherapy, literary theory, anthropology and aesthetics. I am specifically indebted to the literature and practice of psychoanalysis for my thoughts around the child-developmental and psycho-evolutionary stages displayed in classical yogic thought. I have given the textuality of my remix a fluid mood, presenting it in prose form, in sentence form with contemporary poetic line-breaks, in its conventional mode of one aphorism per line, as well as aphorism-plus-commentary interlaced. My intention is that this visual flexibility helps to hint at the oral and performative quality of the aphorisms, and to loosen the feelings of calcification that often accrue to ‘important books’. My thought is that if this book is as visually variegated as the oral tradition is variegated in accent, tone, projection, aural ambience, digression, and anecdote, perhaps it can actually begin to do what it describes: disrupt conscious patterning with moments of perceptual wonderment and unexpected integration. Interlaced amongst Patanjali’s reveries are my own, in the spirit of encouraging others to dream in the language of yoga philosophy as well. What should a root yoga text say, given what we now understand from evolution, phenomenology, and psychoanalysis? From neuroscience, humanism, feminism, and deconstruction? To ask such a question would be to be honest about what we need, and to take full and excited responsibility for how our lineage evolves. Awareness is not an eternal, abstract or extractable ideal: it evolves through time, and in intrinsic relationship with every bit of biology that supports it. Our suffering is not the result of our connection with the world, as the ascetic mood suggests. Nor is it an illusion, as the Vedāntic interpreters of Patañjali insist (Śaṃkara and those who follow). Our experiences of disconnection and dissociation are suffering. Human flesh and feeling is continuous with the feeling flesh of the world: we cannot find a division between them. The movements of gravity, urge, and resolution are endlessly interwoven and pervade all experience. Escaping from their influence would be both impossible and boring. Samādhi – the integrated moment – is commonplace, available to everyone, and cued by everyday intimacies. Excerpt: Commentary to "the Book of Integration"
1.1 We all inquire into yoga. “Now, the teachings of yoga” is the typical translation (Bryant, Hartranft, and others). I have fertilized this simple opening with some of the central themes of threads. Starting with “we”: if we take yoga to be conjunctive — psychologically, socially, politically, ecologically — its study and practice will be intersubjective. With the first person plural, the aphorism becomes self-reflective: yoga is, among many other things, communion through dialogue. The first person plural also implies the “now” of the original opening word atha: dialogue can only take place in the present. “All” invokes inclusivity: if we share anything as a human family it is the drive towards re-integration. “All” also suggests the transhistorical invocation of Patanjali: his atha indicates his process of collating the extant teachings of his day. threads is a similar project. The sound of “all” also retains the phonetic impact of the first syllable of atha, the guttural opening of the throat that begins the Sanskrit alphabet, said to be the first sound of both creation and human speech. 1.2 Yoga happens in the resolution of consciousness. The common rendering of this sutra invokes the goal of constricting experience. “Yoga is the cessation of the turnings of thought,” writes Miller. I remix to “yoga happens”, implying that a state is to be revealed when an habitual distortion is clarified. In translating nirodah as “resolution”, I stay away from “suppression” (Aranya), “inhibition” (Taimni), “restraint” (Sacchidananda), and “control” (Prabhavananda) – none of which would be helpful in the realm of self-evolution practices such as psychotherapeutic care and somatic healing, which always seek to open and add space. “Resolution” implies a sensation of integration, which occurs both naturally and occasionally through willful action. “Turnings of thought” (vrittis) is generalized here to “consciousness”. 1.3 Through yoga, consciousness can become aware of its interdependence. This thread is a first gauntlet thrown down against the isolationist arc of Patanjali’s thought. He posits the “seer” (drastuh, which I activate with “can become aware of”) as an extractable function from the “seen” (prakriti). He teaches that the blending of seer and seen is our fundamental challenge, and that our salvation lies in their separation. These threads explore the opposite: that our pain comes from the alienation of consciousness from livingworld. The seer must re-member its interdependence with perception and the other to avoid the result of thread 1.4. 1.4 Otherwise, consciousness can become increasingly alienated, and awareness becomes inaccessible. “Increasingly”: consciousness can be a continually self-abstracting evolute of the human experience. Our disembodiment and dissociation seem to hurtle blindly forward and upward, as evidenced by our eco-crises. For Patanjali, patterns of consciousness (vrittis) are klista (clashing) or aklista (non-clashing). It’s crucial to remember that neither category is acceptable to the ascetic view, which dreams of complete and permanent un-patterning. 1.6 assertions, confusions, imagination, dreamless sleep, and remembering. 1.7 Assertions may come from witnessing, inference, or belief. For agamah, I use “belief”, replacing “testimony” (Miller and others) and “competent evidence” (Vivekananda), to emphasize the co-dependence of authority and faith. Direct perception and inference are not so mediated. 1.8 Confusions are the misalignment of words and reality. Words generally obfuscate presence. The word is not the thing, a rose by any other name would smell as sweet, and I conceal as much as I reveal as I choose words to represent myself and my thoughts. But in the “confused” pattern of consciousness (viparyaya), the gap between signifier and signified begins at an immediate perceptual level and creates an unintentional fiction. The classic scriptural example is that of mistaking a coiled rope for a snake at twilight. Here, the general obfuscation of words becomes explicit inaccuracy that will immediately confuse another and distort consensus reality. Confusion is a supplementary veil of language-driven consciousness laid over the livingworld. In Vedic linguistics, confusion occurs only at the level of vaikhiri (any spoken word as the audible devolution of the authentic impulse to speak), which arises from madhyama (the speech of dreams, emanating from the heart), which arises from pashyanti (the speech of deep sleep, emanating from the navel), which arises from para (the speech of a perceptually integrated state, emanating from the perineum). 1.9 Imagination is language that drifts away from relationship, towards metaphysics. Miller has: “Conceptualization comes from words devoid of substance.” Here, I place the “imaginary” (Miller’s “conceptualization”, vikalpa) on a scale of language-abstraction, which drifts from the relational to the disembodied. This thread accounts for Patanjali’s focus on our capacity for semiotic ungroundedness, but goes farther to associate this capacity with the language-habit that informs the entire discourse of the sutras. To the extent that Patanjali speaks of such metaphysical quantities as purusha and isvara, he is in the language-realm of the abstract-disembodied, which cannot engender relationship in the same way as does language that describes what we can all see and work with. 1.10 Dreamless sleep is a feeling of nothingness. 1.11 Remembering is the present experience of the past. 1.12 These patterns can be loosened through consistent practice and presence. Vairagya is usually translated as “dispassion”. To choose “presence” turns away from a critique of sensual engagement to promote a relaxed sensuality that rests in the present. The word choice retains a focus on the reduction of expectations, without stripping the practitioner of the passions involved in becoming still or, indeed, the passions of stillness. “Loosened” evokes the etymology of “analysis”, which means “untying”, and carries the mood of psychotherapeutic work. 1.13 Practice is any intentional re-patterning of the mind towards interdependence. “Intentional” is my choice for yatnah, instead of “vigilance” (Houston), “permanent control” (Prabhavananda), or “continuous struggle” (Vivekananda). I favour the language of cognitive behavioural therapy to the language of discipline and punishment, which alludes to a transcendental fall. Secondly, to me, “re-patterning” suggests actual change, providing a balance for “practice” (the rendering of abhyasa by almost every translator), which implies continual preparation. In a phenomenological yoga, there is nothing to prepare for, no one moment more important than others, no future performance of an idealized state. There is simply the experience at hand. 1.14 Re-patterning may occur over a period of consistent and focused effort. 1.15 Presence is felt when you hold no expectation or assumption. 1.16 Awareness of interdependence is the fullest presence. The original aphorism promises disconnection from the most fundamental building blocks of nature, the gunas (gravity, urge, resolution — tamas, rajas, sattva). Bryant, again: “Higher than renunciation is indifference to the gunas. This comes from the perception of purusha, soul.” My thread suggests the opposite: that being immersed in the gunas (the tangible media of interdependence) is “presence”. Here, “presence” might be construed as “dispassion” for what is truly alienating: the abstraction of consciousness from the phenomenological. 1.17 Reasoning, reflection, wonderment, and the awe of being alive are the initial gateways to integration. Yogic skill is akin to hacking the mainframe of consciousness from cognitive towards extra-cognitive states. The task is to become aware of the hidden mechanisms of consciousness so that they can be applied or altered with transparency. The sutra suggests that this hacking flows forward, with analysis preceding insight, which precedes bliss, which precedes understanding how our individuality is generated. The commentator Vijnanabhiksu stages this hacking by describing the order of deconstruction: first we become aware of the object qua object, and then of the act of sensing it, and then of the function of the sense organ, and then of the agency that owns the senses. 1.18 Through integration, these gateways dissolve, leaving unseen traces. In 1.17-18, the difference between samprajnata samadhi (the integration invoked by the “initial gateways” of knowledge) and asamprajnata samadhi (the integration that dissolves the gateways of knowledge in a flash of non-thought) would be the difference between integrative experience that is self-conscious (“I’m here, doing this), and integrative experience in which self-consciousness vanishes (“[pleasure soft pleasure, no thoughts at all, soft pleasure soft]”). Patanjali suggests that at this point of clarity, only “unseen traces” (samskara) remain in what is left of consciousness. 1.19 At death, these unseen traces are resolved into their surroundings and recycled. The original sutra distinguishes here between levels of humans according to meditative attainment: the greater ones (post-humans) disappear into sublime ether while retaining some self-sense, while the lesser ones (merely-humans) are confined to rebirth. I ignore the speculative metaphysics of reincarnation to focus on how the constituents that propelled the yogi towards integration – the samskaras embedded in flesh and thoughts – are commonly and simply recycled into the web of life. The original implies that meditative perfection culminates in the disappearance of the yogi from prakriti, which reinforces the escape-narrative of asceticism. When we subtract the subtraction of the metaphysical narrative, there is no escape from the world that makes us and receives us. We all inquire into yoga. Remembering is the present experience of the past. through consistent practice and presence. of the mind towards interdependence. of consistent and focused effort. the initial gateways to integration. deep memory, focus, and intelligence. The intensity of practice reveals yoga’s nearness. including the focus of devotion. We have always felt it. which, when sung, can reveal hidden things. Then, obstacles to inner spaciousness become transparent. false perception, unsteady focus, and restlessness. Calming practice alleviates these symptoms. or by holding in your heart something you love. the qualities that surround it. or it can be silent. and the mystery of perception. how experience is woven together. Your hidden aspects become integrated. A feeling of authenticity arises. It is deeper than what you can hear or study. It begins to unravel future patterning. Bearing no future patterns, you become unbound. The legacy of yoga has been resurrected in our time through the innate pleasure of our flesh. The simplest techniques of breathing, spinal elongation, and joint fluidity have given countless body-alienated postmoderns a renewed sense of vitality, purpose, grounding, and connection. As technology changes the body — in some ways to the point of ubiquity or uselessness — the meme of modern postural yoga has called out our tissues into the daylight. And although there is surely spectacle involved, evoking complicated feelings about how the flesh should look or move, most practitioners know that yoga’s real gift is that of internal sensitivity. In modern yoga we are given a physical culture that rewrites the meaning of flesh from the inside out. If the breath isn’t relaxed, we know we’re not quite there. If thought has not stilled and focussed into the waves of present sensation, we know there’s more (or less) work to do. Further: if the pleasure of musculo-skeletal alignment and warmed circulation does not somehow sweeten our interpersonal relationships, lend resilient courage to daily life, and inspire us towards social and ecological justice, we know we’re missing something. Through modern postural yoga we have remembered that our flesh innately wants to rejoice, connect and serve, and that it does not lie. This yoga renaissance is quietly rewriting a central theme of its parent tradition. The body has rarely if ever been considered as its own value in older yoga cultures. At best, the body has been seen as a vessel for an unseen higher essence, and therefore an instrument for its own transcendence, as per the many tantric and natha yoga lineages. Less positively, the body has been seen as the definitive proof of separation from divinity, as in the bhakti yoga lineages. And perhaps the most negative view of all — the body as the repulsive devolution of consciousness and an obstacle to the recovery of self-knowledge — has been the hallmark of many ascetic views that in no way reflect our present values, yet echo stubbornly through our discourse and unspoken sentiments. The yoga sutras of Patanjali fall squarely into this ascetic mood: compiled from the sayings of renunciates of many stripes who at the dawn of urbanization fled their families and social roles to tiny forest ashrams, where, with great austerities, they attempted to tame the unruly and desirous body towards the goal of transcendent epiphany. Patanjali says little about the value of embodied sensation. He says little about interpersonal love, and nothing of children or ecology. He presents an ultimately internalizing path, in which ethics are a means towards social disentanglement, and the body has evolutionary value to the extent we are disgusted by it (sutra 2.40). In other words, he teaches exactly against the present zeitgeist of yoga culture. And yet his book is presented, largely uncritically, as a seminal text in most yoga education programmes throughout the world today. Our dogged adherence to it is either a sign of nostalgia for a bygone age, or, more problematically, a hidden wish to console our complex interpersonal suffering through social withdrawal and meditative narcissism — which some might say we’re already accomplishing through consumerism. But we are also powerfully enthralled by Patanjali’s unwavering examination of conscious and unconscious processes. There is something mystically attractive about an Axial Age description of thought and psychological patterning presented with such quiet authority. My experience is that many who encounter the aphorisms have the immediate sense that they arise out of a non-distractedness that our world and culture can rarely offer. They suspend us in a mood of extended contemplation and confident stillness. One of the primary attractions of the text, regardless of the philosophy it presents, is that it highlights the relative crudeness of our speed, our data-saturation, our ambivalence, our vulnerability to alienation and the banal. And in a world of limitless copy, the economy of these aphorisms shines like the edge of a blade. It is this close and precise attention that I wish to translate here, if not the metaphysics. Philosophy will change through discourse: all tenets are temporary and unstable. What does not change is the requirement of attention that makes our changing discourse evolutionary, as opposed to supplementary. I offer this text and commentary as an alternative speculation on what Patanjali’s attention and incision might offer us today, within a far different social-philosophical context than his own. A context in which renunciate withdrawal will not heal our interpersonal pain or speak to our social diseases. A context in which we desperately need re-embodiment and grounded connection to our ecology. A context in which that magic of bodily pleasure that got us practicing in the first place becomes the basis for reaching out with love into the world that made us, has always held us, and which we never wish to leave. You can buy the book directly, through CreateSpace. "This is a massively important work… finally a philosophical text rich in contemporary wisdom that can speak to the radical embodiment and deepening intimacy with ecology and relationship that modern yoga practice inspires. Matthew is not only the most stunning writer in prose working in the (underpaid) world of yoga discourse he’s also one of its most fluent cultural critics. More importantly, what he does here is pave a new road forward for the future of Western spirituality: embodied, psychologically informed, with an aesthetic so potent it has the power to heal." "…I find myself continually challenged, informed, and bedazzled within its pages…"
"If you know about the Yoga Sutras, I think you should get your hands on a copy of Remski’s book. Really. It’s the only edition I’ve read that… Gets me through the second half of the Sutras without falling asleep. Names the secret ingredient I always knew Patanjali left out of his sauce. Grabs my ear with language as beautiful as the sounds of Sanskrit. Lights sparks for me over and over again by striking Patanjali’s flint with the steel of modern science and philosophy. Shows me how to reject and love a spiritual text at the same time." 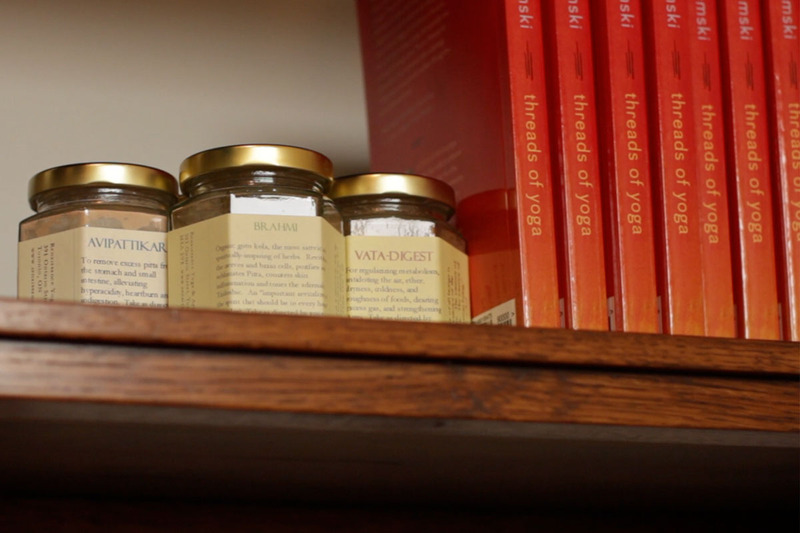 "I believe it will change the way we think about Patanjali–and the yoga we all practice– for many years to come. Creative, original, and full of great heart." "I’ve struggled with the sutras for a while. Bits of wonder mixed with confusing, un-useful threads that take me down dead ends. You’ve done a great job of reflecting modern thinking and making the whole book useful. I find your writing intelligent and humble. Good all around. I’ve been using your remix of the guna-s : urge, gravity, resolution, in my classes this week. Crossing between the tangible/scientific and metaphor/spiritual to gracefully bring clients deeper into yoga." "The book makes a great contribution and should be of interest to both scholars and practitioners." "You reveal the [Sutras] to be as much a work of poetry as philosophy, and as much a work relevant to multiple forms of daily practice as to speculative, even soteriological, reflection." "The beauty of this book is its relevance and context in modern society. Through the skillful hand of an accomplished, contemporary writer, who is a respected practitioner of yoga and ayurveda, this remix of Patanjali’s sutras shows the very positive influence and creativity the West can have on the evolving art of yoga. This book is a must read for anyone interested in applying the ancient principles of yoga to our crazy, modern lives with originality and humor!" "[Remski] attempts, quite movingly, to reawaken us to the beauty and power of the world around us–to leave the guilded cage of our metaphysics and become a part of the world that made us, rather than believe that we are the genesis of our own mother and father. The spiritual logic of threads weaves a bright pattern of humility: accepting the mud of this world as parent, the body as source of thought, relationship as the locus of meaning. It seeks to reposition our awareness back to being creatures of this world rather than divine creators, or worse yet, as spiritual prisoners of the flesh." "I am blown away by it. Being as familiar with the sutras as I am, it was an absolute delight to read your creative translation in reference to the dry old standards in my memory, and feel reinvigorated in the validity of my own interpretations. Your work renders the sutras relevant anew, and creates a link for me between the modern yoga of my intuition and the classical yoga of my learning." "I find your contribution a serious and worthwhile contribution to the unfolding of the history of yoga philosophy. It comes from “inside” the complex process of tradition and tells us that tradition now extends far beyond the original, the context of India, and into the modern world of western thinking." "Patanjali must be rolling in his grave, laughing and so happy." "I don’t know of any reading of the yoga sutras as wildly creative, as impassioned and as earnest as this. it engages Patanjali and the reader in an urgent, electrified conversation that weaves philosophy, symbolist poetry, psychoanalysis and cultural history. There’s a kind of delight and freshness in this book that is very rare in writing on yoga, and especially rare in writing on the yoga sutras. This is a Patanjali for postmoderns, less a translation than a startlingly relevant report on our current condition, through the prism of this ancient text." "I’m awed by the fearless audacity with which you approach the sutras. And have been enjoying the dialogue you’re creating between an articulate post-modern mind and a powerful traditional text." "It actually does what the Yoga Sutra is supposed to do: to serve as a string of seeds for meditation and self-reflection. I actually think this is the version of the YS all training programs should be reading."